Your wedding plans may include a large formal ceremony or an intimate casual gathering. For your unique and special day, the music you have selected will be performed with a professional presentation by Jim Lammers. 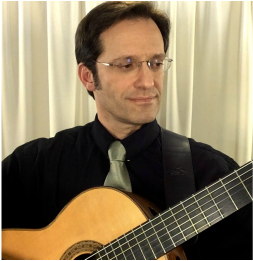 The live solo guitar performance will gently surround your ceremony. The soft guitar artistry will welcome your guests as they arrive. Processional music will accompany the wedding party entrances. Interlude music may include a special request piece or transition music for candle lighting, wine box, etc. At the conclusion of your ceremony, an upbeat and joyous recessional piece will be played as the wedding party exits. This will be followed by post-ceremony music to maintain the mood as your guests adjourn to the reception. The reception music will be composed of upbeat and romantic selections performed to enhance your celebration. The volume of the live solo guitar performance at your wedding will be supported with professional quality amplification. Any necessary equipment will be set up in a timely manner before guests arrive. The volume level will be monitored appropriately for the size of the venue and the number of guests. The amplification system also includes a wireless lapel microphone for the officiant and a handheld microphone for any readers. This flexible amplification system makes a complete sound production package for your special day. Solo guitar song list and video clips. Solo guitar performance services and fees.